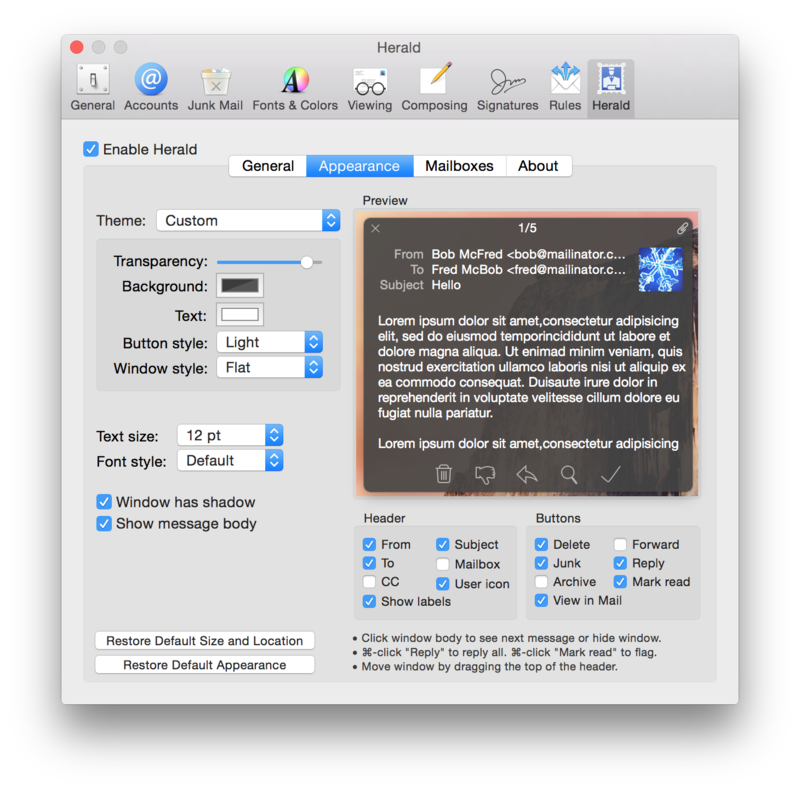 Herald is a plugin for Mail.app that goes far beyond macOS's built in notifications. Herald allows you to perform common actions directly from within the notification window, including deleting, initiating replies, or marking as read. And Herald's appearance is customizable, so you can tailor it to your own taste. 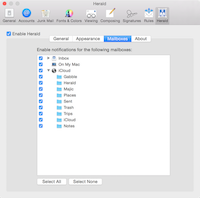 Herald is a free download for macOS High Sierra. If you like it, please consider donating! Fix an issue where the preferences window could crash when using custom appearance. Fix an issue where deleting would cause main Mail window to open. Support for macOS High Sierra. Fix issue with Gmail accounts wrongly triggering notifications for unselected mailboxes. Command-clicking the message body now views message in Mail. Support for OS X 10.11.4. Support for OS X 10.11.2. Support for OS X 10.11.1. Fixed an issue where notifications would show up for disabled mailboxes. Viewing a message in a new window now behaves the same as the built in OS X notifications (it doesn't open the main Mail window). Support for Mac OS X El Capitan. Support for OS X 10.10.2. Support for OS X 10.10.1. Support for Mac OS X Yosemite. New light and dark themes that utilize Yosemite translucency. Support for OS X 10.9.4. Support for OS X 10.9.3. Fixes an issue where messages would not be moved to junk mailbox after being marked as junk. Messages will only be moved to junk if you use the "Move it to the Junk mailbox" setting in Mail preferences. Support for OS X 10.9.2. Support for OS X 10.9.1. Support for Mavericks Mail Update 1.0. Support for new Macbook Pros. Fix an issue with overlapping headers on non-English systems. Fix an issue where the notification window would not show up by default with some Gmail accounts. New release for OS X 10.9 Mavericks. Refreshed appearance and added new "Solid" option. Added support for OS X 10.8.5. Added support for OS X 10.8.4. Fix for non-English characters being garbled in message body. Hopefully fix some hanging problems on Mountain Lion. Play sound at alert level rather than system volume level. Fix problem with window changing position when switching monitors. Uninstaller now removes preferences also. New icons for Retina MacBook Pro. Fixed an issue where Herald wouldn't start if Mail was launched automatically on login. New release for OS X 10.8 Mountain Lion. Option to add CC in the notification header. Messages from VIPs indicated with a star by their name. Option to show notifications only for VIPs, only for people in contacts, or for everyone. Signed with Developer ID to work with Gatekeeper. Added support for OS X 10.7.5. Added integration with SpamSieve 2.9. If SpamSieve 2.9 is installed, marking a message as junk will now train it as spam with SpamSieve. Support for OS X 10.7.3. New option to delay showing notifications until a specified time period has passed. For example, you could choose to only show notifications every hour so that you won't be interrupted too often. Changed option-clicking to command-clicking for reply-all and flag. Support for OS X 10.7.2. Font size can now be reduced down to 10pt. Fixed an issue where duplicate notifications could appear. Fixed some potential memory leaks. Reduce automatic update checking interval. New release for OS X 10.7 Lion. Option-clicking the "Mark as Read" button will mark as read and flag the message. 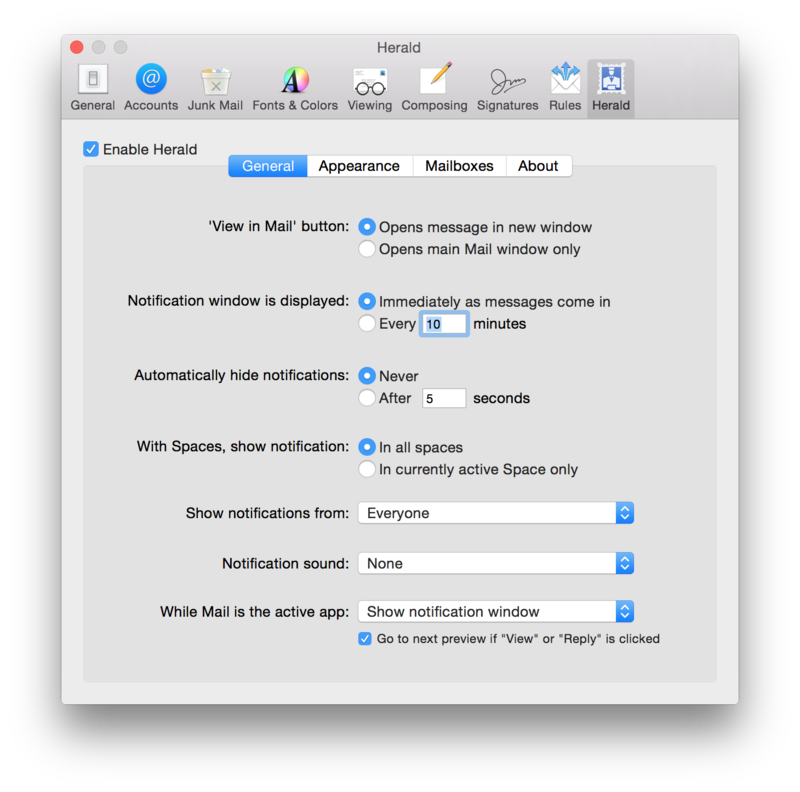 Option to hide notifications while Mail is active, but keep existing notification window visible when switching back to Mail. Now automatically checks for updates. May or may not work with Mac OS X 10.6.8 September 2012 security update. 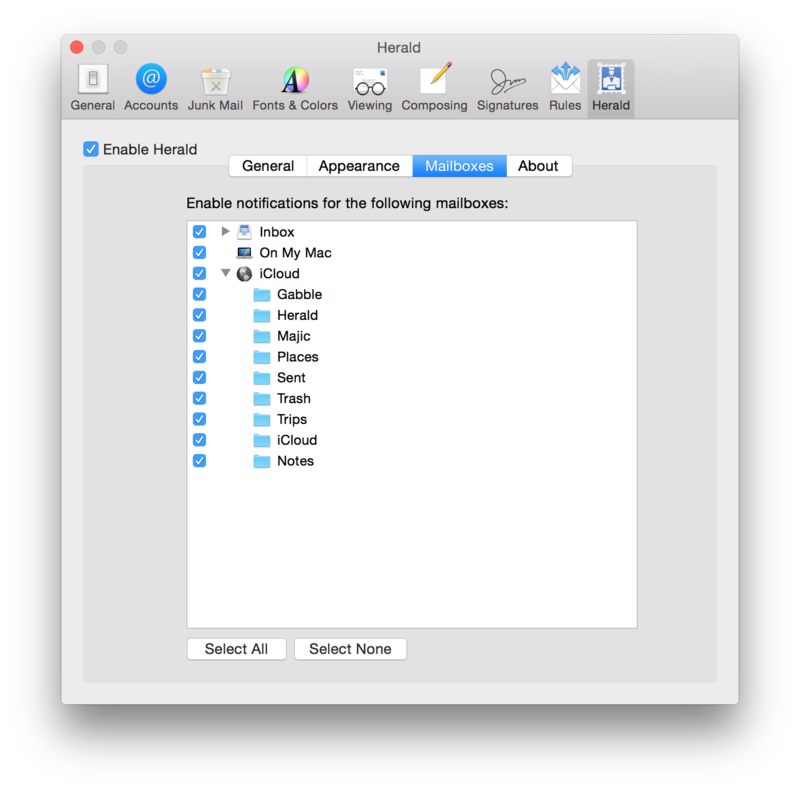 Fully customizable header; show/hide "From," "Subject," "To," "Mailbox," user icon, and header labels. Two new window styles: "gradient" and "flat"
Notification window can now be resized small enough so that the entire message body is hidden. Added support for Mac OS X 10.6.5. Added support for Mac OS X 10.6.4. Added an attachment indicator icon in the upper right of the notification window. Added an option to keep the notification window visible even when Mail is the active application. Added an option to use a monospaced font. Mail is no longer brought to the front if the notification appears while Mail is hidden. Changed the behavior of auto-hiding notifications when there is more than one message. Now after the specified time has elapsed, the next message will be displayed rather than hiding the window. Once all messages have been viewed, the window will hide. Fixed a bug where notification window could automatically hide even when the mouse was over it. Fixed a bug related to Spaces where Mail would become the selected application instead of Finder. Added a button for marking a message as junk. Added option for showing notification window on all spaces. Added option for changing font size. Option-clicking the reply button now initiates a reply-all. Fixed a bug where window was not remembering its size after quitting Mail. Fixed some bugs relating to replying. Added support for Mac OS X 10.6.2. I just installed Herald. Where is it? Where are the preferences?? Once Herald is installed, open Mail and go to the "Mail" menu and choose "Preferences..." Herald will show up as one of the preferences at the top right. Help! I sent myself a test email but the notification window didn't show up! Why not? Keep in mind that by default the Herald notification window only shows up when Mail.app is in the background (i.e., when Mail is not the active application). You can change this setting in the preferences. Why am I getting duplicate messages sometimes? This can happen if the same message is being duplicated in multiple mailboxes. Try enabling the "Mailbox" header in the Herald appearance preferences and seeing which mailboxes the duplicate messages are going into. Then you can uncheck those mailboxes in the Herald mailbox preferences to disable them. I see that multiple messages are grouped together. How do I go to the next message? Just click anywhere in the message body to advance to the next message. If there is only one message, clicking the message body will dismiss the notification window. Can I dismiss the notification window without performing any action on the message? Yes, you can just click the message body (see the answer to the previous question). Also, you can always click the close button in the upper left corner to dismiss the window no matter how many messages there are. Can I change the position or size of the window? Yes, you can move it by dragging the titlebar like a normal window, and resize it using the resize widget in the lower right corner. How do I uninstall Herald? You can't. Just kidding! There's an uninstaller in the Herald.zip download. Note: old versions of Herald are no longer under development and are not being officially supported. Easily perform actions on messages: mark as read, initiate replies, delete, and more, right from within the notification. Messages are grouped into a single notification window to prevent clutter. Flip through messages with a single click. 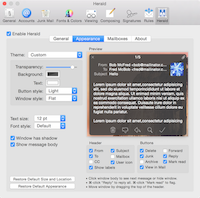 Adjust window size, style, font, position, color, shadow, and transparency. 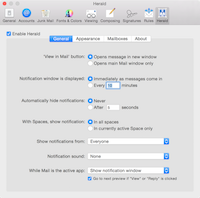 Enable notifications for all mailboxes or only specific mailboxes of your choosing. Configure Herald to dismiss notifications after a set period of time or stay on screen until the window is clicked. 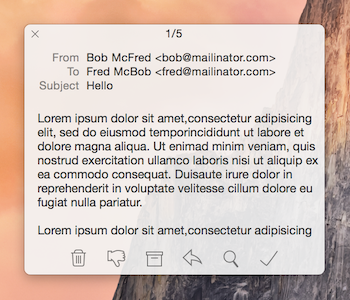 A scrollable message window means you can view the full message without having to switch to Mail. From my testing, it works as advertised. I especially enjoyed the full message-reading capability. A rare moment here folks, we've cast our critical Top Tech eye over this app, and we just can't find anything we don't like! The coolest mail plugin tool ever.